Situated in the urban center, Da'an Forest Park officially opened in 1994, bordering Jianguo South Rd. in the east, Xinsheng South Road in the west, Heping East Road in the south, and Xinyi Road in the north. Covered in grasslands, trees, flowers and foliage plants, there is a Buddha Statue and a bamboo forest in the south, an open - air theatre for art performances in the center, and an accessible recreational area surrounding it attracts many park visitors. Known as the "lungs of Taipei City," the park is a green world unto itself. 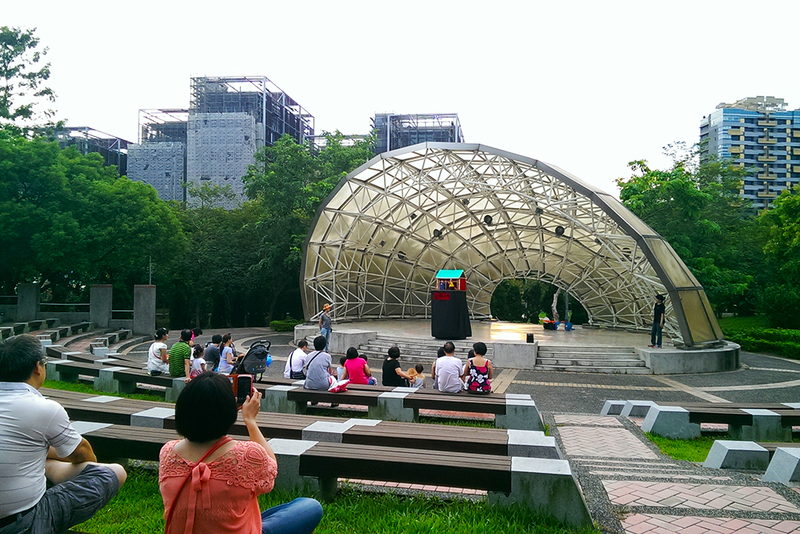 Besides shaded trails for pedestrians and joggers, the park is equipped with a wide range of recreational facilities, including a public square, public bicycles, open-air music stage, children playground, kiosks etc, providing Taipei's citizens with a valuable green space and the best venue for exercise and recreations. Forest is the homeland of water sources. In addition to providing various recreational functions to the public, the park is a place where priceless water resources are nourished. Therefore, the Water Resources Agency, Ministry of Economic Affairs, hopes to educate citizens, by means of formative influences, to cherish the limited water resources; the means include water saving apparatus installed inside the park, the public toilet demo system, and the water purification plant experiment; and to make the park the best showcase of water preservation. 1. Nat'l Hwy 1 → Exit at the Yuan Mountain (Yuanshan) Interchange → Jianguo elevated Rd. → Exit at the Xinyi Rd. Interchange → Sec. 1 to Sec. 2, Jianguo S. Rd. → Sec. 2, Heping E. Rd. → Sec. 2, Xinsheng S. Rd. 2. Nat'l Hwy 3 → Muzha Interchange → Nat'l Hwy 3A → Exit at the Taipei Interchange → Sec. 3, Xinhai Rd. → Sec. 2, Fuxing S. Rd. → Sec. 2, Heping E. Rd. → Sec. 2, Xinsheng S. Rd.